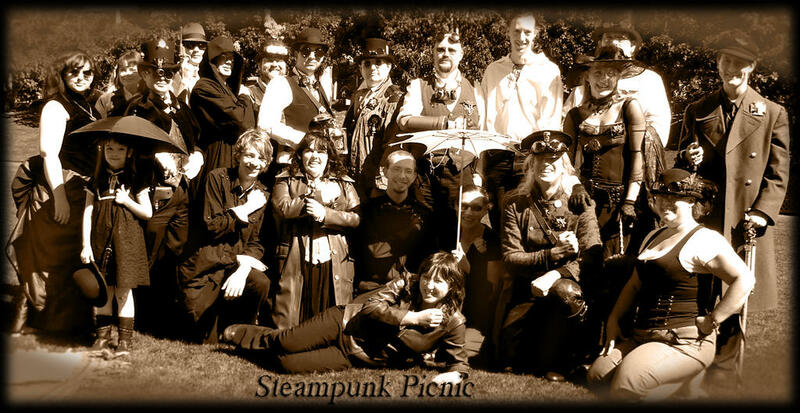 The Brisbane Steampunkers picnic on Saturday had about 35 people turn up all told and some fantastic outfits. Most of the pictures are on the Facebook event at http://www.facebook.com/home.php#/event.php?eid=99289119155 but we’re working on moving some of them to non-Facebook areas so non-Facebook people can see the outstanding efforts. I cannot describe what a great time I had at the picnic, and I want to thank everyone who turned up - from the girls and guy who turned up first with the crazy chocolate cookies (2 minute noodles?) through to the organisers of Prometheus Bound (awesome Steampunk nightclub) who arrived in the afternoon after getting some much needed sleep. Especially to all the photographers. This entry was posted on Friday, August 7th, 2009 at 9:11 am	and is filed under Culture. You can follow any responses to this entry through the RSS 2.0 feed. You can skip to the end and leave a response. Pinging is currently not allowed.